Rancho Santa Fe’s exclusive 6.7 square mile radius comprises some of the most high tech residences in San Diego. The average home in Rancho Santa Fe has more complex networks, technology, and sometimes staff actively operating than some small businesses: With Wi-Fi networks throughout the property, high-output printers, and performance computers capable of managing both work and play in addition to multiple iPhones/Android Phones, iPads and tablets, laptops, desktops, Kindle’s, Blu-Ray Players w/ Netflix and other streaming video… we’re more connected than ever before! So, what happens when something doesn’t work? You find yourself not able to get your work done, not able to sit down and stream “Luther” on Netflix (if you haven’t seen it, you must! ), or the kids come down in a daze, complaining about the dumb wireless being out again. Maybe you find yourself on the phone with Cox, Time Warner or AT&T and they have you reboot this, unplug that. You call Microsoft, Apple or your antivirus provider, only to get nowhere fast. “Please hold sir, while I transfer you to that department…” only to be disconnected or transferred to the wrong department…again. Perhaps you’ve called your company’s IT department for help, and either got a firm, “we don’t support home users” or you had to deal with that condescending corporate IT “courtesy” you’ve grown to loathe. You may have even called a big brand technology retailer only to find their “Geeks” were not available to come help until next week or later. Kyle Hanson had all of these scenarios in mind when he started San Diego Computer Help. He wanted an IT company that focused on 1950’s style charm and customer service combined with the computer know-how of a large IT firm, sent right to your home or business. San Diego Computer Help is a small local business offering same-day or next-day onsite service to Rancho Santa Fe and the surrounding areas in San Diego. Their technicians are handpicked to have the technical expertise to identify and resolve even your most complicated technical issues, while being genuinely friendly and personable. They even have the ability to explain complex technology in a language anyone can understand. 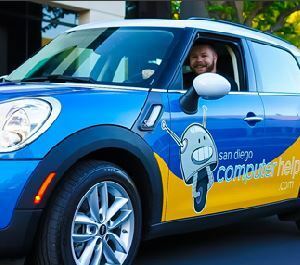 San Diego Computer Help is available to help you Monday through Friday (and Saturday by advance appointment only), and offers daytime and evening onsite appointments. If you need help with anything technical, give them a call and a smart, friendly Computer Helper will come to your home or office ASAP!